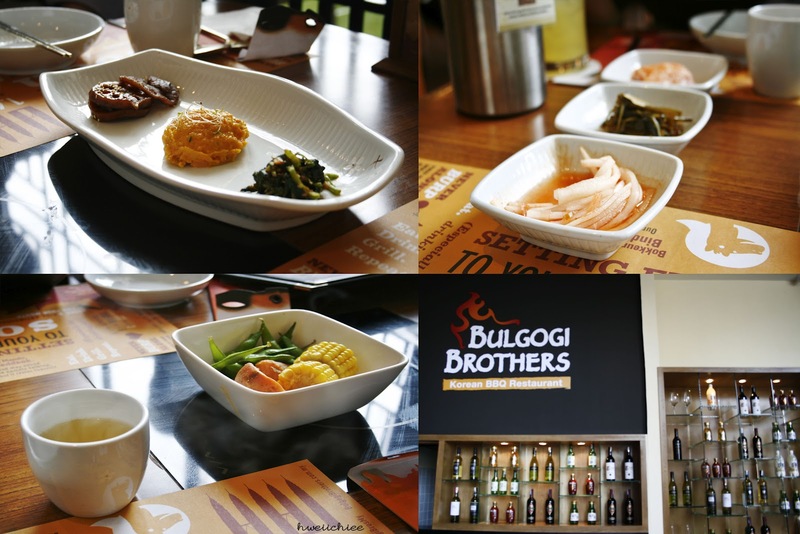 So just yesterday, my dear uncles invited me to Bulgogi Brothers in Paradigm Mall for a delicious Korean BBQ lunch. MC jiujiu who went there once before, told me it's the best Korean BBQ in Malaysia. Such a strong statement in just one visit? This place is a popular franchise which originated from Korea. One of the few rare pork-free korean (BBQ) restaurants here. 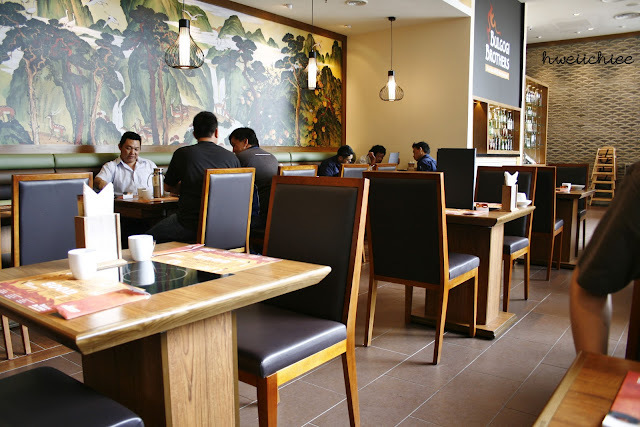 Instead of the usual hanging smoke-suction vents found in the usual Korean restaurants, they have theirs embedded on the ceiling. Awesome. 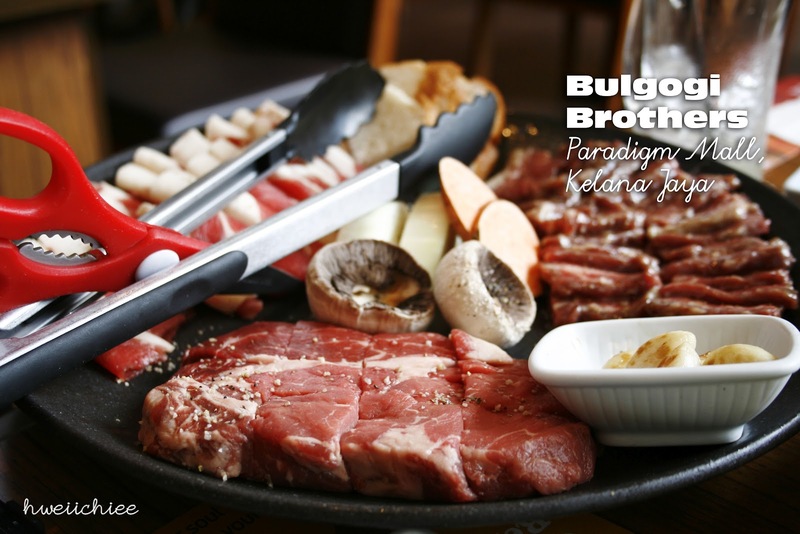 Bulgogi Brothers is located right next to TGI Friday's in Paradigm Mall. This mandu was kinda different compared to the other's I've tasted. First of all, the shape is kinda different. Usually the edges are folded in, but this one isn't. These golden-brown dumplings encases juicy fillings of meat and chives. The medley of seafood served with it(mussels, prawns, squids) tossed in homemade spicy sauce was really appetizing as well! Good thing it was crispy, but wasn't greasy. 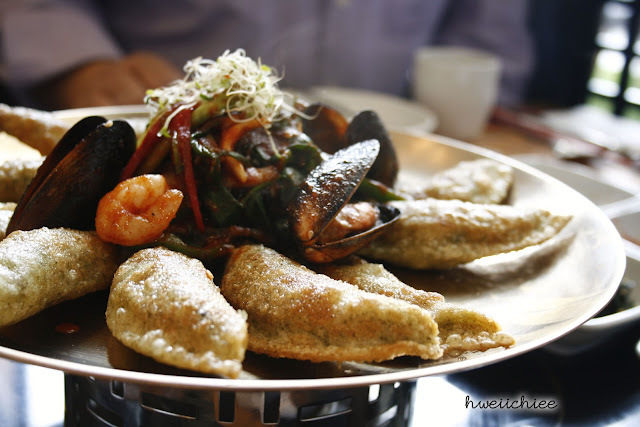 Haemul Pajeon - A "must have" Korean-style pancake with seafood and green onions. The waiter told us that the dish came late because their first one had their edges a bit burnt, so they had to redo it. At least it shows they take quality control seriously. I'm not that huge a fan of Pajeon, but they all said it was great. It was really stuffed with ingredients though! Unlike all the other places which has more flour instead. 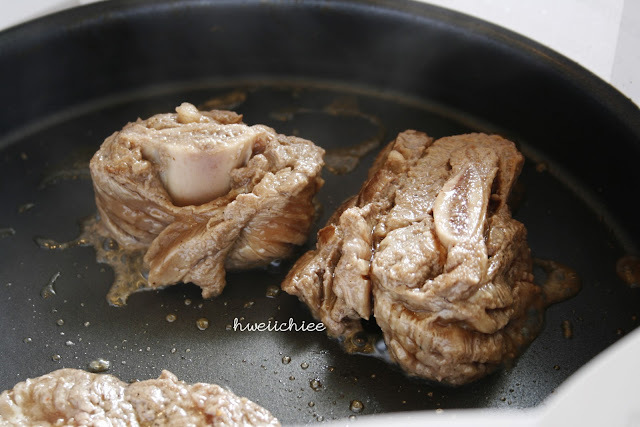 Kkotdeungsim, Galbi Kkotsal, Chadol Baki. The waiter started by grilling the vegetable first. 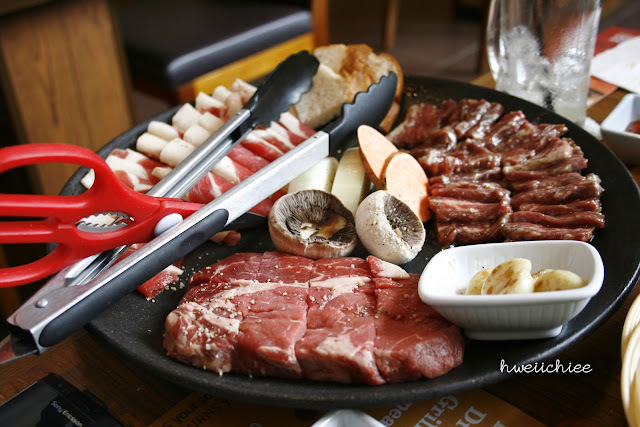 Then, he started to grill the meats, using the bread to mop up the juices. 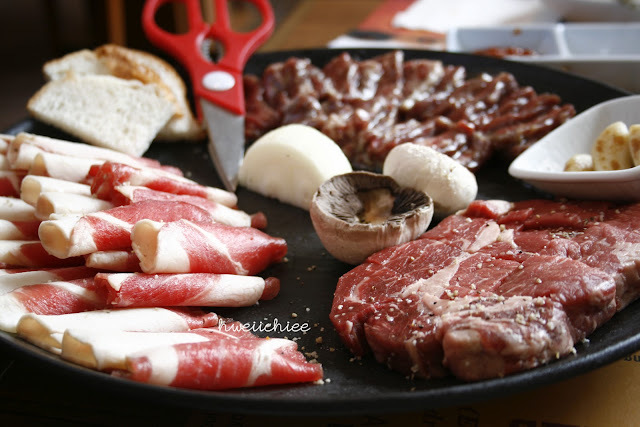 (To prevent the meat from getting soggy and over-cooked). Would have preferred it slightly more charred though. You'd have to let the waiter know. Sizzling on hot plates imported from Korea. Out of all of them, I liked the Galbi Kkotsal most. 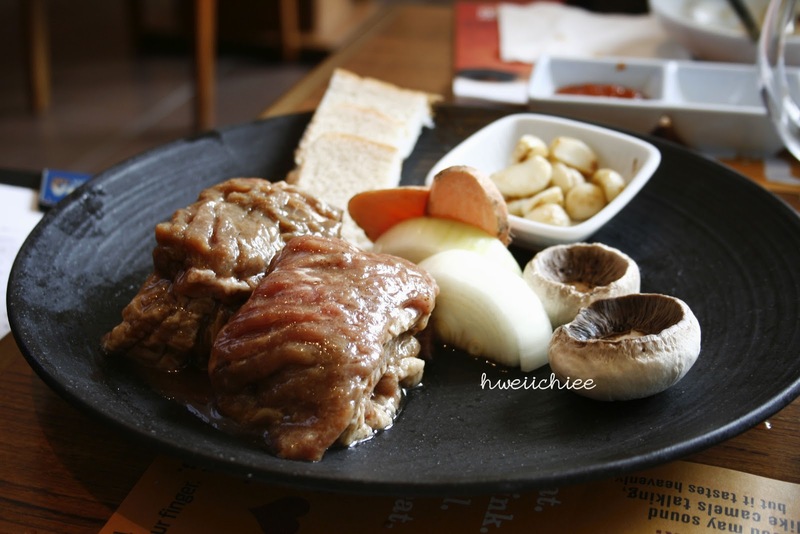 Next up, Yangneom Galbi - Beef short ribs marinated in special galbi sauce. Instead of the usual beef bibimbap, we opt for the seafood bibimbap. It came out halfway through our BBQ, which explains for the overcooked egg you see at the bottom of the stone bowl. We asked for an extra raw egg, which they gladly obliged. 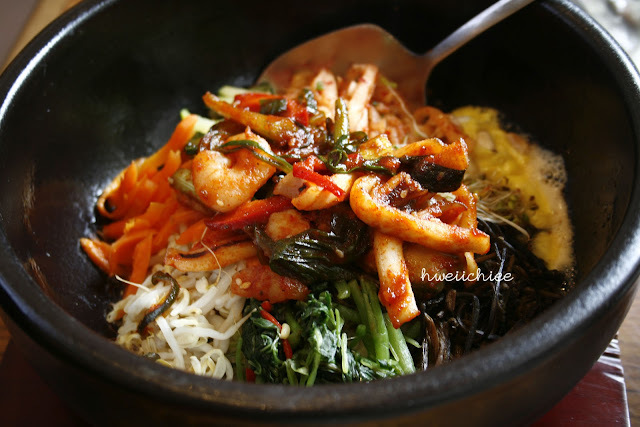 The chili paste was very sparingly served in the bibimbap, so we requested for more to be added to it. In overall, this dish wasn't as impressive compared to the others. It was okay lah. More like a carb-filler. 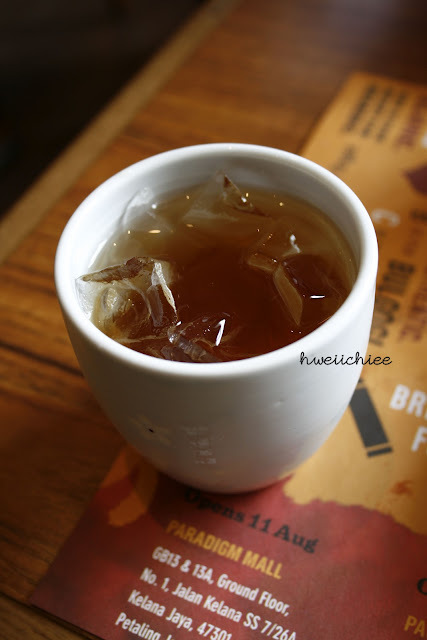 We ended our satisfying Korean BBQ lunch with a complimentary iced apple tea/juice drink. The lunch at Bulgogi Brothers was delicious! Service was good too. Price wise it is slightly-above average for a meal (pretty much the same with all Korean BBQ restaurants). One important thing this restaurant has definitely got right is the freshness of the meat. Location: Bulgogi Brothers, GB13 & 13A, Ground Floor, Paradigm Mall, 1, Jalan Kelana SS7/26A, Kelana Jaya, 47301 Petaling Jaya, Selangor. Till I update about my Vietnam Trip!